From the middle of the 20th century and through the 1970s, it was common for scientists to report a rapid warming of “nearly 1° C“ between about 1890 and 1940 (Agee, 1980), a warming accompanied by “catastrophic” and “violent” glacier retreat. In 1959, eminent Princeton geologist Dr. Erling Dorf reported that annual mean U.S. temperatures rose by 3.5°F (+1.9°C) between 1920 and the 1950s (Visher, 1954). In Antarctica, temperatures rose by 5°F (+2.8°C) from about 1900s to the 1950s (Wexler, 1958). In the Arctic, temperatures rose by 14°F (+7.8°C) between 1910 and the 1940s (Willett, 1950). 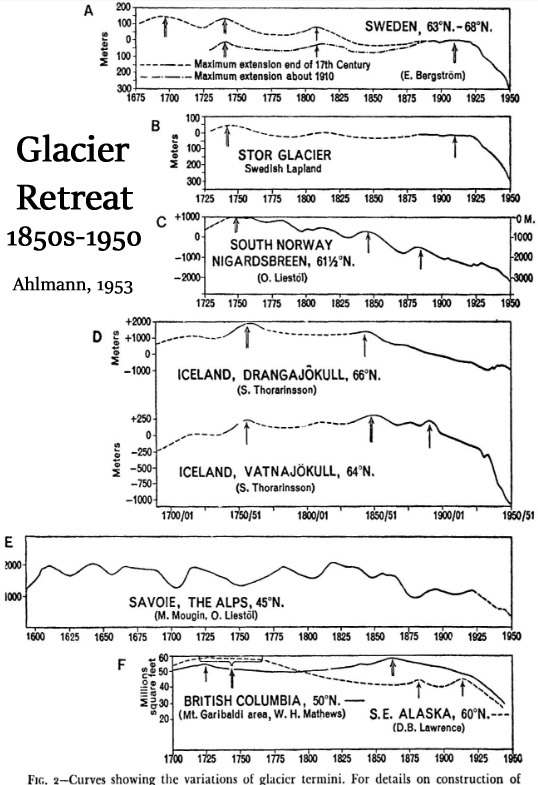 Dr. Hans Ahlmann (1953) provided a graphical representation of a pronounced Northern Hemisphere-wide glacier retreat that largely commenced in the 1850s and was ongoing as of 1950. The geologically-affirmed existence of an explosive 19th to early 20th century warming accompanied by a “violent” and “catastrophic” wide-scale glacier retreat is not convenient to the computer model-based narrative that says the rise in anthropogenic CO2 emissions is predominantly what causes dangerous warming and glacier retreat. So the overseers of the global temperature data sets decided the explosive late 19th to mid-20th century warming and “violent” and “catastrophic” glacier retreat needed to be removed from the scientific record. 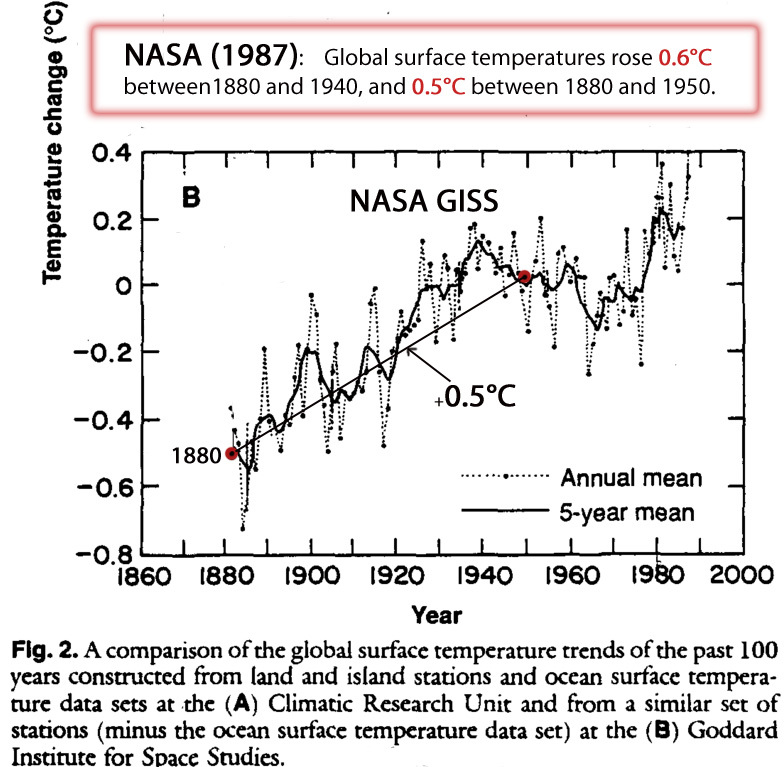 Even as late as 1987, global data sets depicted a 0.5°C warming between 1880 and 1950. 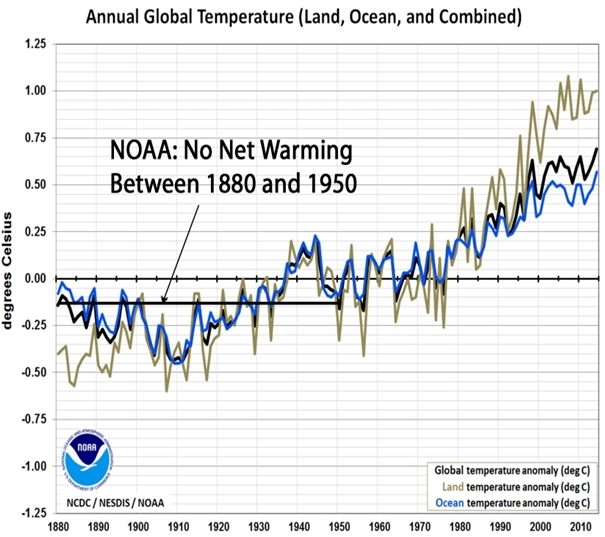 By 2014, all of the 1880 to 1950 warming (0.5°C) had been removed from NOAA’s representation of global temperatures. The scientific literature is teeming with geological evidence affirming the explosive warming and glacier retreat during the 1850 to 1950 period. 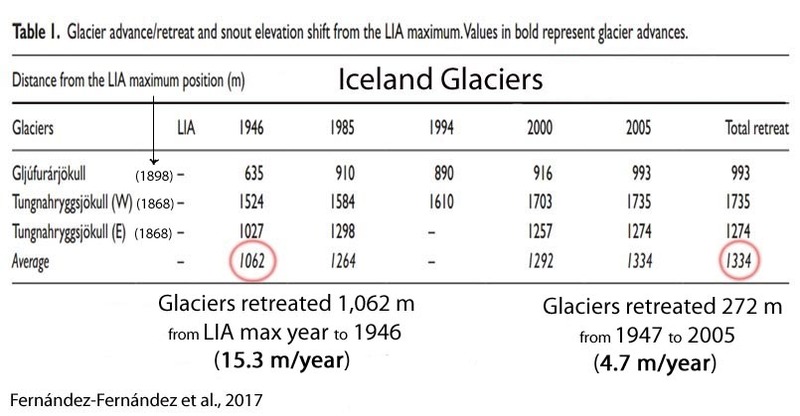 In other words, scientists are not providing support or confirmation for the narrative that says the post-1940s anthropogenic CO2 emissions increase has coincided with unusual, unprecedented, or alarming glacier retreat. (1) Rates of glacier recession the second half of the 19th century similar to recent decades. (2) Alpine glaciers receded more during the 1860s-1880s and 1920s-1950s than in recent decades, and the Alps are over 3°C colder now than a few thousand years ago. 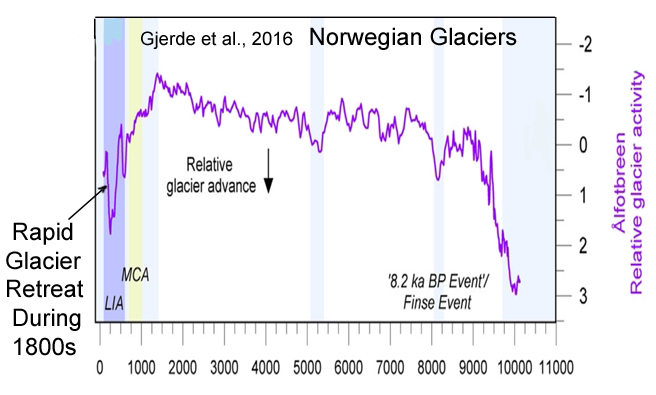 (4) Norway’s glaciers are currently more advanced than nearly all of the last 10,000 years, with pronounced recession occurring during the 1800s. (5) On a global scale, glacier recession rates have dramatically decelerated since the 1920s to 1950s period. 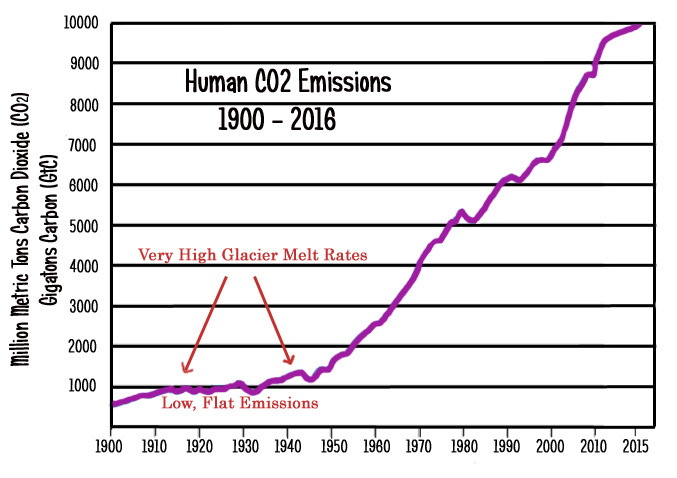 Advocates of the position that humans exert a profound and dangerous influence on the Earth’s temperatures and glacier melt point to the rapid increase in human CO2 emissions (purple trend line) as the condemnable culprit. The trend in anthropogenic CO2 emissions was essentially flat and very low (averaging just 1 gigaton of carbon [GtC] per year) from about 1900 to 1945, when a significant portion of the modern glacier recession occurred. Emissions rates were negligible during the high-melt-volume 19th century too. Explosive growth in human emissions occurred after 1945, when a significant deceleration in glacier melt (and even decades of advancing glaciers) occurred. This historical evidence would not appear to support the position that anthropogenic CO2 emissions drive both warming and glacier melt. when it warms, glaciers retreat until either a new equilibrium between ablation and accumulation is found or until they disappear. Has it ever occured to you that this equilibrium moves quicker when the temperatures are lower? E.g. 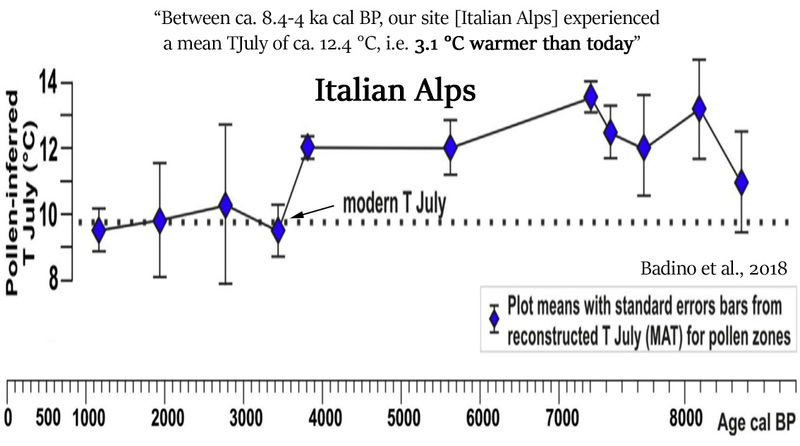 temperature increases from X to X+1 and the glaciers retreat by Y. Next temperature increase from X+1 to X+2 results in a retreat smaller then Y and so on. Looks like glacier melt is accelerating, doesn’t it? Has it ever occured to you that this equilibrium moves quicker when the temperatures are lower? So why do you think it is that East Antarctica has been cooling (“ubiquitous cooling across East Antarctica” [Clem et al., 2018]) and gaining mass for the last several decades? The Western Antarctic Peninsula’s surface air temperatures have been cooling rapidly since 1999 (“a cooling trend of − 0.47 °C/decade during 1999–2014” [Oliva et al., 2017]). So what’s the mechanism for the glacier melt there? And why did glacier retreat occur more than 3 times faster from the 1860s to 1940s as it has from the 1940s to 2000s? What was the mechanism for that factor-of-3 more rapid glacier retreat, since CO2 levels hovered around 300 ppm throughout the earlier period? Relative to what baseline period? Oh. So you’ve determined glacier melt has been accelerating by comparing the 3-year 2001-2004 “trend” to the 4-year 2001-2005 “trend”. Do you understand that to determine acceleration vs. deceleration, it’s statistically preferable to use a baseline reference point that lasts longer than a few years? What exactly is the connection of your reply to the question you have quoted? What was the mechanism for that factor-of-3 more rapid glacier retreat, since CO2 levels hovered around 300 ppm throughout the earlier period? Do you ever read more than the abstract? Come on, even you should have noticed what the sentence you quote means. Hint: it’s not about acceleration. Figure 2 would be about acceleration, a rather obvious one. In other words, I was asking you to explain why it is that your “when it warms, glaciers retreat…” comment is not applicable to East Antarctica, where it has been cooling and mass gains have been occurring for decades. Now that you understand the connection of my reply, please respond to the questions. Again, you are trying to push your points. But it should be obvious that a cooling is no warming, right? No connection, it’s just you pushing your points. Trying to show inconsistencies where none exist. And you are trying to make me answer questions again. It’s not my fault that you have no basic understanding of the mechanisms and only rely on cherry picked quotes to show whatever it is you want to show. Unbelievable! And now you think you have the capacity to read my mind and tell me what I was responding to. Your hubris is loathsome. You are wrong. I wasn’t replying to what you claim. I was replying to the first few words of your comment, which, again, were “Dear Kenneth, when it warms, glaciers retreat…” To repeat myself and correct you, I was asking you to explain why it is that East Antarctica is cooling and gaining mass…since this doesn’t fit with your comment. East Antarctica isn’t cooperating. I wanted to know what your reasoning is as to why it isn’t cooperating by cooling and glacier advance. But, of course, you refuse to answer such questions. Instead, you evade and make up silly reasons for your evasions. Now it’s “you pushing your points”. As if characterizing my question that way precludes you from having to provide an answer. And you are trying to make me answer questions again. It’s not my fault that you have no basic understanding of the mechanisms and only rely on cherry picked quotes to show whatever it is you want to show. Is East Antarctica warming and losing mass, or is it cooling and gaining mass? Do you view this as a trick question? It’s instrumental data, SebastianH. If you understand the mechanisms, please explain why East Antarctica is cooling and gaining mass. For that matter, explain why Southern Hemisphere sea ice has been growing since 1979. What’s the mechanism for that? Excuse me, you quoted a question of mine and replied with something unrelated below that quote. That’s what you did. There is no need to read your mind. If you meant to quote something different, but didn’t do so, that would explain your unrelated reply. Was that the case? If you understand the mechanisms, please explain why East Antarctica is cooling and gaining mass. I fail to see how that would contradict “Dear Kenneth, when it warms, glaciers retreat”. Cooling is no warming. For that matter, explain why Southern Hemisphere sea ice has been growing since 1979. What’s the mechanism for that? Last time I checked sea ice mass in Antartica was decreasing. During a period you describe as “GHE hiatus”. Swiss Glaciers vs the AMO. Yes, glaciers respond to NATURAL WARMING and COOLING CYCLES. Tree stumps and even human artefacts have been discovered under NATURALLY RETREATING glaciers as the climate WARMS NATURALLY from the coldest period in 10,000 years. We are lucky to live in a SLIGHTLY warmer period, with the added benefit of enhanced atmospheric CO2 to help feed the increasing world population. It has always amazed me, Andy, or would if there was anything left in climate psyence that could, that people leap and down and point to trees or dead bodies that suddenly appear from retreating glaciers as evidence that it is all worse than we thought and we are all doomed, etc, without apparently drawing the obvious conclusion that at some stage in the past that bit of countryside must have been able to support life. Who is stoopid, them or us?? you may find this study titled “Glaciers in Mongolia’s Gobi Desert actually shrank during the last ice age” of interest. Basically they find that even though temperatures were very low during the last iceage, the glaciers retreated due to the very dry atmosphere. Or was it because the had too much CO2 in the atmosphere 😉 ? IMO The notion of “equilibrium” used at this point is spurious! The glaciers are a dynamic entity, like sea ice, etc., and are constantly in flux with the constantly changing conditions around them. This highlights the thinking of some that weather and climate can have some sort of spurious stasis condition. They never have and still do not, they are in continual flux, the perceived accelerations and decelerations change. A while bask I stumbled upon a paper describing the glacier on Kulusuk Island, Greenland. This glacier is a probably a remnant of a larger continental glacier. However the paper reminded me of H.Hk Lamb’s discussion of mountain glaciers mentioned in this blog article.